don’t hold back, life is either a daring adventure or nothing at all!!! 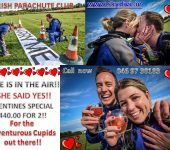 Get our amazing Valentines Special Offer of 2 Tandem Skydives for € 440.00. A massive saving of € 120.00!! Offer runs until Tuesday 14th February! !